Casa Price with Rosa's authentic cooking plus housekeeping! CASA PRICE: Villa, 3 Bedrooms, 2 Baths (Sleeps 2-6). $1,750 Per Week. Come and be spoiled at Casa Price. Rosa will cook and clean daily (except Sunday) so you don't have to on your vacation! Authentic Mexican dishes and Rosa's love for Casa Price will make your vacation wonderful! Rosa is part of the family helping you enjoy your time at Casa Price for over 20 years now! Casa Video - "https://www.youtube.com/watch?v=1A84t6IA_E8"
FEATURED IN THE BOSTON GLOBE TRAVEL PAGE ON 4/10/05. Located in Playacar, Phase #1. This three bedroom, two bath home (not a condo) has a view of the ocean and the island of Cozumel from the living room, dining room, kitchen, and master bedroom. If you are looking for the best location to the beach and 5th Ave, you have found it; a nice, clean, and colorful villa at an affordable price. The house is located only 30 yards from the beautiful white beaches and just a short walk (10-15 min) into Playa del Carmen's 5th Ave with restaurants, shops, and nightlife. Enjoy your coffee, fresh squeezed orange juice, and breakfast that Rosa will prepare for you in the dining room or on the patio (upon request). You'll have a breathtaking view either way. There are stairs to the roof from the upstairs patio for those of you that like all day sunning or star gazing! The lower level has a large entrance foyer, two bedrooms and one bath. The house is decorated with bright island colors with authentic Mexican art! For your vacation pleasure, Rosa, our housekeeper, comes everyday except Sunday (at no extra cost to you). She will do all cleaning including making the beds, freshening up bathrooms, and doing all household laundry. If you have some personal laundry just ask! Those of you who do not want to spend your vacation cooking or going out for every meal, Rosa will prepare breakfast and lunch-- she'll even help you shop for the food. For those of you that like to sleep in or want your privacy, just let Rosa know and she'll give you privacy. We provide all purified drinking water. WIFI included. My mother built this home in 1993 and lived in it for about 7 years before returning to the US to be closer to her grandchildren. The home has stayed in the family and has been rented when family is not there. Playa Del Carmen was known as a small fishing village in the 90s' and has become a popular place to vacation with all of the conveniences we're used to but still has a quaint feel to it because of the restrictions on big hotels or other high rise buildings. 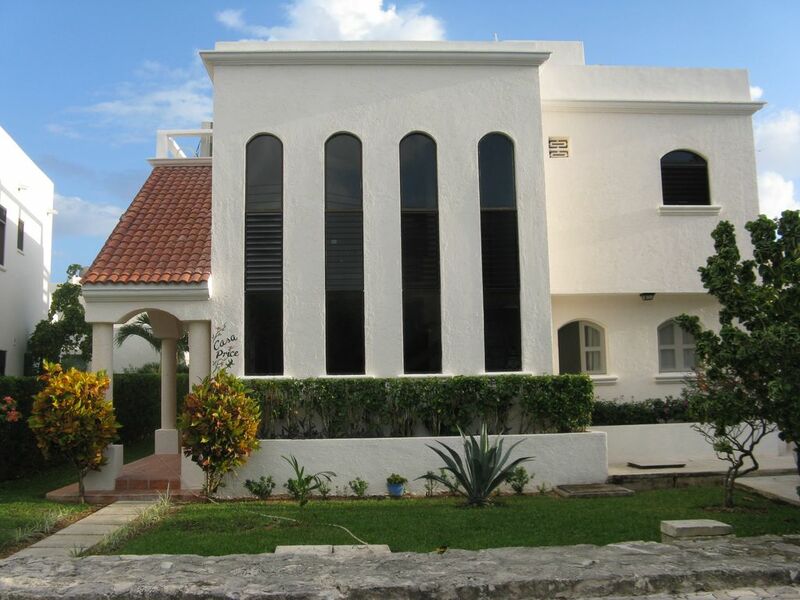 The neighborhood, known as Playacar -fase 1 is the only single family oceanfront neighborhood in Playa del Carmen. A short walk to many shops, restaurants, coffee shops, etc...but once entering the gates of the neighborhood, you are in a quiet, secluded neighborhood. Beach activities are available on the beach including parasailing and jet skiing and skydiving! The home itself has a very authentic Mexican feel and is comfortable and charming. Rosa! You will enjoy her kindness and hospitality. She is truly a gem! In the home however operated only by Rosa. Just ask if you need something washed! Full-time housekeeper included. Rosa comes 6 days from 8am to 3pm. She prepares your meals (breakfast & lunch) if you want. No added charge. Located in a gated and secure neighborhood. Guards on duty 24/7. House is within a 15 minute walk to the 5th Avenue shops and restaurants. The beach is behind the home accessed by walking a very short distance. View to beach is visible from balcony of the house. You can hear the ocean.